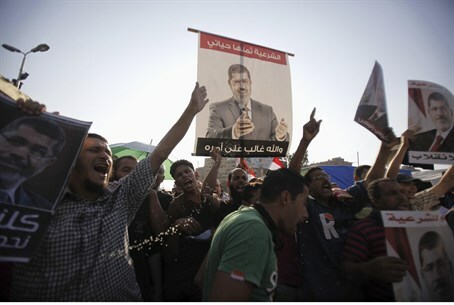 Security forces are expected to start taking action against supporters of ousted President Morsi who are staging sit-ins. Egyptian security forces are expected to start taking action early Monday against supporters of ousted President Mohammed Morsi, who are gathered in sit-ins across Cairo, security sources said Sunday, according to the Al Arabiya network. Supporters of the ousted Islamist president have been besieged in camps located at Rabaa al-Adawiya and al-Nahda Square. The sit-in has resulted in confrontations between the army, which toppled Morsi last month, and supporters who demand his reinstatement. “State security troops will be deployed around the sit-ins by dawn as a start of procedures that will eventually lead to dispersal,” a senior security source told the Reuters news agency on Sunday, adding that the first step will be to surround the camps. Another security source said the decision to take action, just after celebrations following the Muslim holy month of Ramadan, came after a meeting between the interior minister and his aides. Egyptian authorities have been urged by several Western and Arab mediators not to forcibly disperse the protesters, who at times can number as much as tens of thousands. Foreign envoys from America, Europe, Africa and several Gulf Arab states have been visiting Egypt in the past month, trying to resolve the crisis peacefully with little success. The government had allowed the envoys to visit jailed Brotherhood leaders in order to give a peaceful solution a chance. Egypt's interim president, Adly Mansour, blamed the Muslim Brotherhood for the failure of international talks aimed at resolving Egypt's political crisis and warned Morsi’s supporters that the government will not make any concessions to them.